Welcome to the ProtoAZ – 18 Card Challenge at Phoenix Comic Fest. 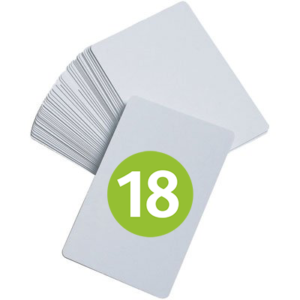 Games must use no more than 18 cards and one play sheet no larger than 8.5×11 (single sided). The play sheet may contain text and graphics. Please include the title, an introduction, rules, and designer credits. Cards must be 2.5 inches x 3.5 inches (Poker size) with either squared or rounded corners. 2 copies of each game must be entered; one for the judges and the other for public play. ProtoAZ and Phoenix Comic Fest are not responsible for damages or loss of either copy. Your game can be boxed or bagged but cannot include any additional text or graphics. Optionally, your container may have text and graphics that are also found on the play sheet. Participants must be respectful of other participants, organizers, staff, and other guests of Phoenix Comic Fest. You may be disqualified if you are determined to be too disruptive. Teams are expected to share or otherwise handle prizes they may win at their own discretion. ProtoAZ and Phoenix Comic Fest are not responsible for how your team divides any winnings. At least 1 participant on the team must be 15 years or older. Children 12 and under must be accompanied by an adult at all times at Phoenix Comic Fest. Any artwork used must be original, public domain, or otherwise properly licensed. If the licensing requires attribution please include it on the play sheet or a separate sheet. Pictures from the competition may display the artwork publically. Artwork is not judged. * One participant on a team will require an event badge for at least Sunday, May 27th. ** See the Phoenix Comic Fest event schedule for ProtoAZ event times and locations. The quality of your rules are potentially the most important aspect of your game. If the judges cannot figure out how to play they aren’t likely to think positively of it. Also, be careful to use an easy to read font. Artwork won’t be considered for judging but the graphic design should communicate the mechanics clearly. Be sure to use a clear font that is large enough for easy reading. Consider sleeving your cards as to prevent them from being damaged. You can use transparent sleeves to have a custom printed back or use sleeves with only one side transparent to only display the card’s fronts. Including a playing card (MTG, Pokemon, etc) behind or in between your paper cards can be used to provide rigidity. Any method of making the cards are accepted. Join the Facebook group Phoenix Game Makers Guild for more tips and to ask questions. For more discussion join The Phoenix Game Makers Guild on Facebook. 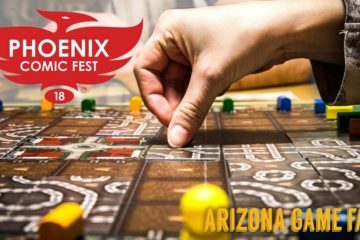 More information on tabletop gaming at Phoenix Comic Fest 2018 follow the event page on Facebook. Do you have to attend the con to participate in the competition?